I was attending the Mobile World Congress in Barcelona earlier this March. That’s 90’000 busy folks in 8 huge exhibition halls, lots of talks, exciting meetings and truckloads of new ideas. So when I was driving back from the congress venue in a packed bus and was browsing through my twitter timeline, I definitely felt a bit exhausted. But: I still needed to figure out where to grab something good to eat in this amazing city. So, there I was, standing in this bus, when suddenly a tweet caught my attention: Estrella Damm, one of Spain’s most famous beers, was answering exactly the question I had in my mind: Where to go after the MWC? It’s always cool to see how brands embrace the potential of creating integrated content experiences and how their content marketing creates value for their (potential) customers. In the spirit of sharing such examples, I decided to screenshot the whole experience so you have the full case and can follow each step. It’s actually a simple idea, but executed very well. 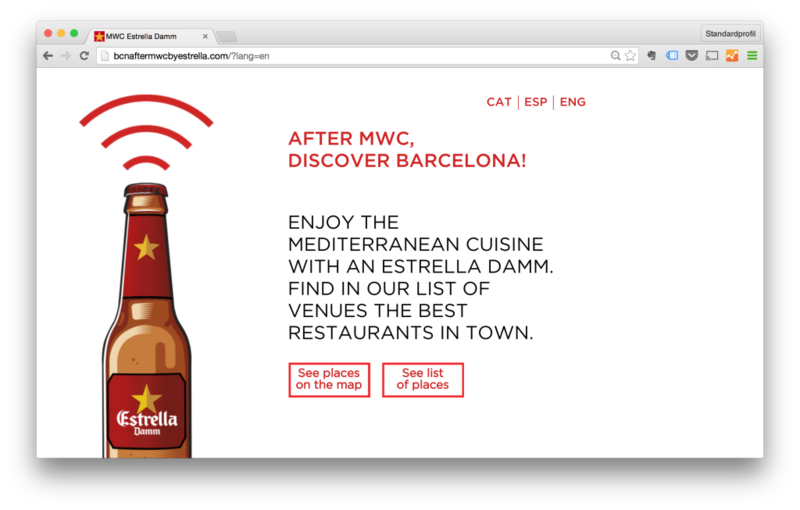 Estrella Damm has used keyword targeting to reach all twitter users in Barcelona who have either tweeted about #mwc15 or searched for this hashtag. They ran different promoted tweets, eg. this one that showed up in my timeline after Mark Zuckerberg’s keynote. The landing-page is pretty straightforward. I like the WiFi-beer logo that for sure connected to the MWC’s theme of connectivity and mobile internet. Simple copy, clear value proposition – and three languages so nobody gets lost in translation. Of course there’s Google Analytics running on that page (but no remarketing tags). 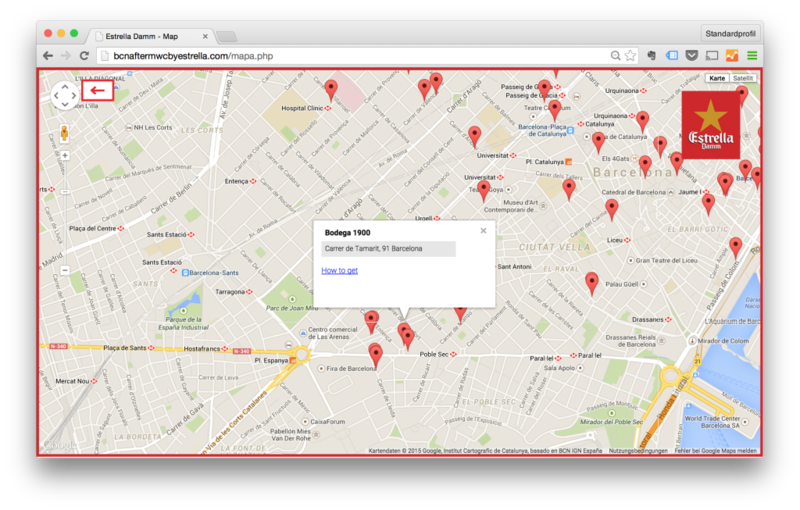 So, this is the actual content: A pretty extensive map of recommended places all over Barcelona. There’s no actual information about each bar or restaurant – it’s really basic: Name and address. Any integration with Foursquare or Yelp would have definitely made sense, and also the page doesn’t render that well on mobile devices. This looks like a quick and dirty (“agile”) solution – but nevertheless, it worked and did the job. As my hotel was very close to one of the recommended places, I decided to put Estrella Damm’s recommendation to a test and visit the Bodega 1900. It turned out to be a very smart thing to do, as I’ve landed in a real gem of a bodega that is run by the same team as the famous El Bulli. So, if you ever visit Barcelona, I can highly recommend spending an evening there – just order the ‘Menu Surprise’ and enjoy the ride. 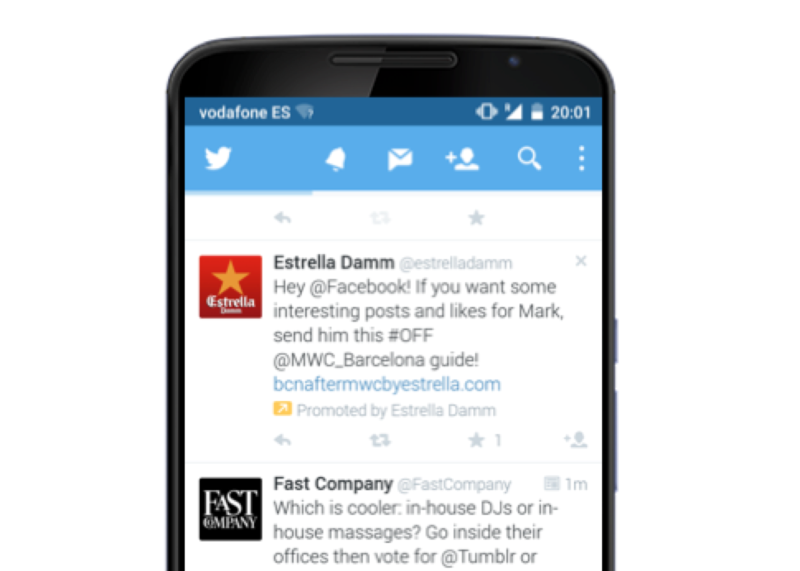 So, thank you Estrella Damm for promoting that tweet and helping me to find a great place after an exciting day at MWC. Cheers!